Cupcakes 'n Daisies: I'm Ready for Christmas . . . . While I was out of town, the final block for the Fat Quarter Shop Kate Spain 2010 Designer Mystery Block of the Month project came. Hurray! I was so happy to be all caught up with blocks one through eleven and ready to wrap up this project. It seems like I've been working on it forever, even if it was only one block a month. The block, The Final Touch, is designed by Sherri Falls of This and That Patterns. I thought the pattern company sounded familiar, and when I went to check out her website I discovered that I own a few of her patterns, Wagon Wheels, Just Before Dawn, and Butter Churn. 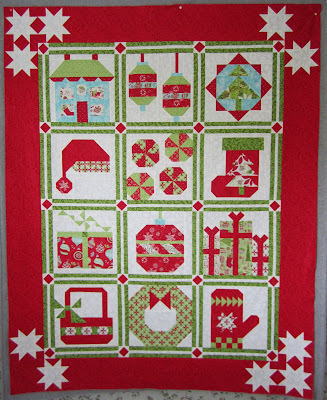 Another funny coincidence, a friend on Monday showed me a quilt she was planning to hand quilt for her Mom, and the pattern was Posie Patch, another Sherri Falls pattern that's a log cabin quilt with adorable applique posies in the setting triangles. A perfect name for the last block I think. I changed the fabric for this block because it used the same fabric that I used on another block that I changed when it came. 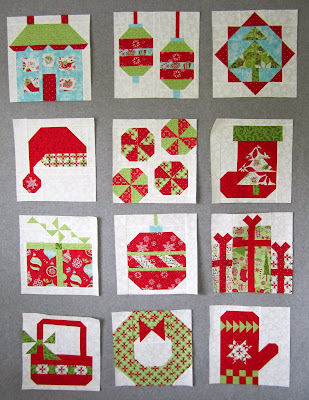 As a matter of fact, I changed, swapped or tweaked every block but one, the wreath block. And now that it's all done, I wish I would have thought to frame that block with the background fabric so it didn't meet the sashing. I like white space, I added some when I could but I think it could have stood some more. So here's my final block placement, I think I had those blocks in every possible combination before deciding on this one, the perfect one! The finishing kit used the red fabric that's also used in the hat, stocking, basket and mitten. I thought that was a little too much red too close to those blocks so I switched to the green. 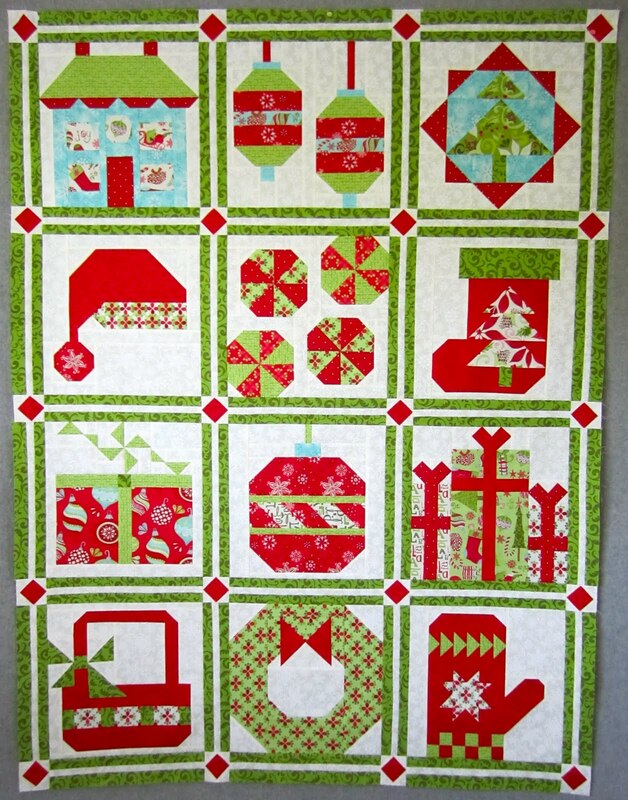 Plus the green complimented the poinsettia fabric I was going to use for the outer border (not part of the finishing kit). 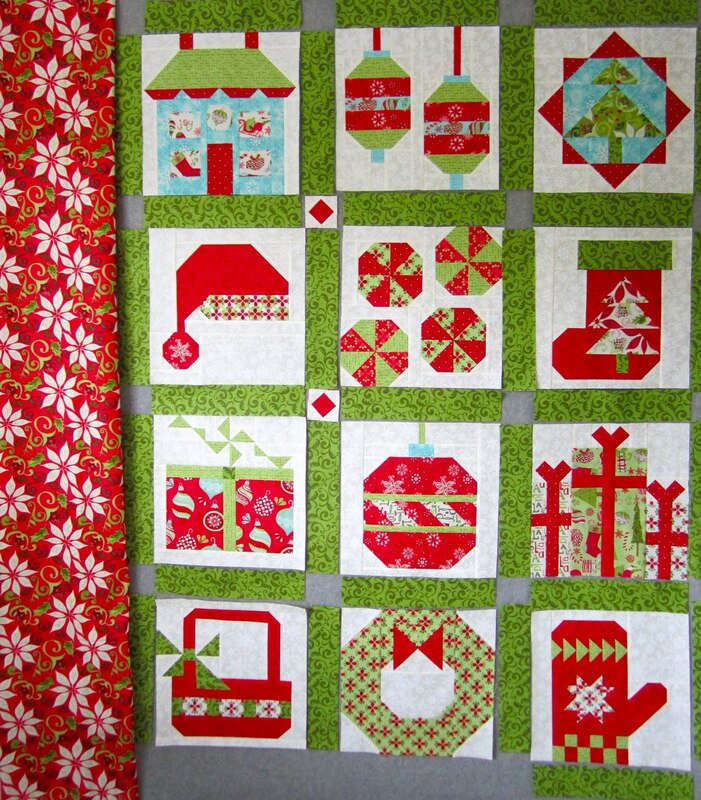 When I auditioned the green sashing and the poinsettia fabric on my design wall I thought "Eew". A little to wild for me, and even though this quilt is going to live in LA with my daughter, I thought that combination was a little too loud and distracting for her too. Step One, I toned down the volume on that green by adding a 1/2" strip of the background fabric down the middle of those sashing strips. 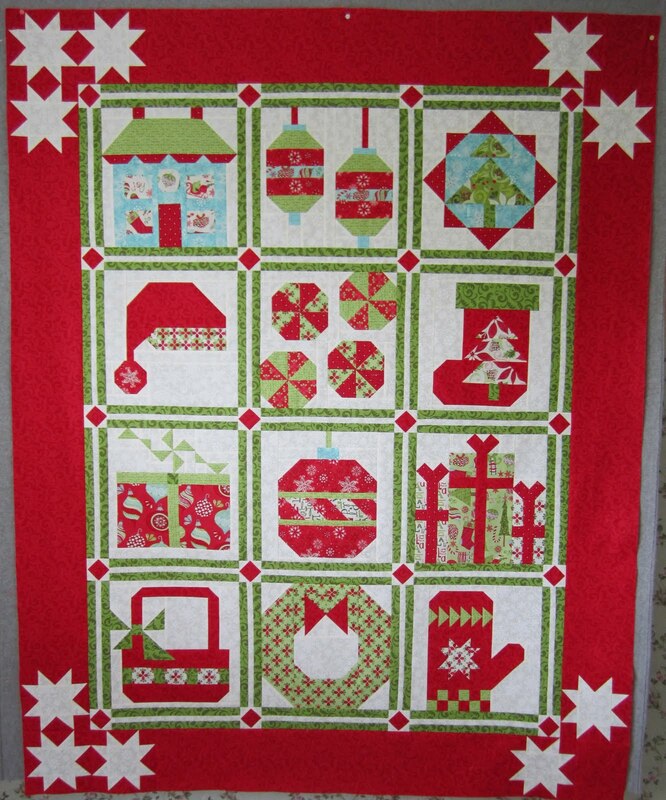 I stayed with the cornerstones from the finishing kit, which was designed by Brenda Riddle of the Acorn Quilt & Gift Company. 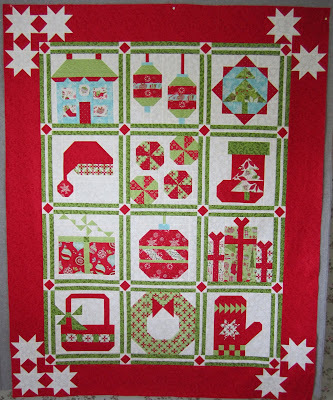 I pretty much went with the outer border designed by Brenda Riddle, except she used the blue snowflake fabric and I went with the red. Also, the finishing kit finishes at 64" x 78", and the space where this quilt will be hanging is 59 inches wide, so I made my outer border a little narrower. I thought the pattern in the finishing kit was perfect, a little personality but not so much as to compete with the blocks in the center. I was so proud to have the quilt all done, put it on my design wall to take that last photo to share with you when I noticed, no . . . surely I didn't . . . I DID, I put that bottom sashing strip on upside down!! UGH!! It's supposed to have two stars in the lower left hand column, not three!! So here's the conversation I had in my head, "Who cares, it's not like it even matters, it looks OK, it doesn't look unbalanced, really, just leave it, Favorite Daughter will not know the difference, the top fourth of the quilt will probably be on the other side of the rod, no one will even know, just leave it . . ."
You know me, I couldn't leave it. . . . This if Lifetime Quilt Number 71.
and has approximately 772 pieces. This was my first official block of the month, I signed up for one from another shop once, but the fabric that came was so horrible I never made it, I just tossed the ugly fabric and saved the pattern. Now that it's all said and done, I think I've decided I'm not a mystery block of the month person. 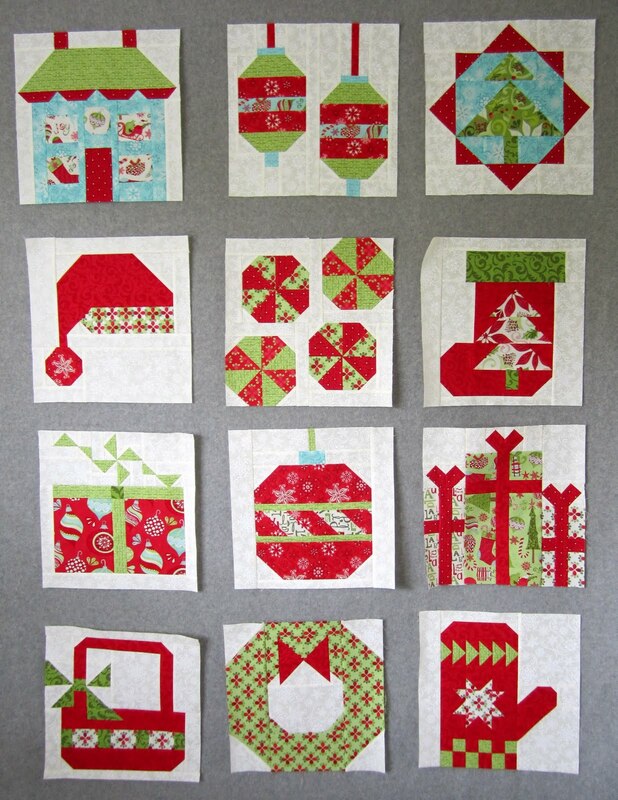 I enjoyed getting and making the blocks each month, Kimberly and the folks at the Fat Quarter Shop are very generous with the fabric and the instructions were marvelous, and I thought the patterns were just adorable, but this quilt would look very different if I were making all the blocks at once. You know me and changing up patterns (I think it's a middle child syndrome, wanting to be different) and it's hard to change up patterns when you don't know how it's all gong to come together until the end. All in all, I think this is a very cute quilt that suits my daughter and her condo perfectly. 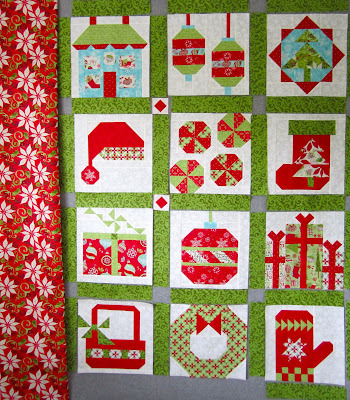 I'm hoping to see your finished 2010 DMBOM quilt, be sure to drop me a line when you finish yours! Like how you decided to finish the quilt .... it looks great! Fabulous finish, Thelma! I love the way you did the sashing! I'm sure your.daughter will love it! It is AWESOME!! I was going to sash in red (I didn't get the finishing kit) but you know, I really like that solid green! I may do that one. I love yours. 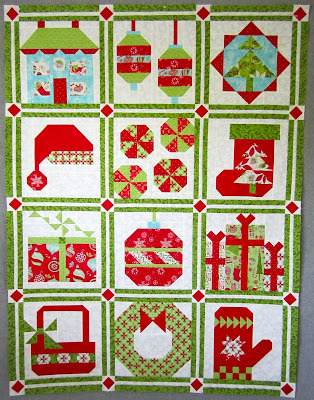 This quilt is just adorable Thelma, and the perfect Christmas quilt for Ashley! She is treasure it. I guess I had better get this pattern before it is too late! "She is going to treasure it"--obviously I am still half asleep this morning and can't type. ha ha ha!!! you would NEVER have left that bottom sashing alone - i knew without scrolling down that it would already be fixed. i love what you did with the sashings around the blocks - the center white strips really make them pop. i'm with you on mysteries - life is mysterious enough, i don't think my heart can take on quilting palpitations, too. Once again you have thought and tweaked and worked your way to a fabulous finish. 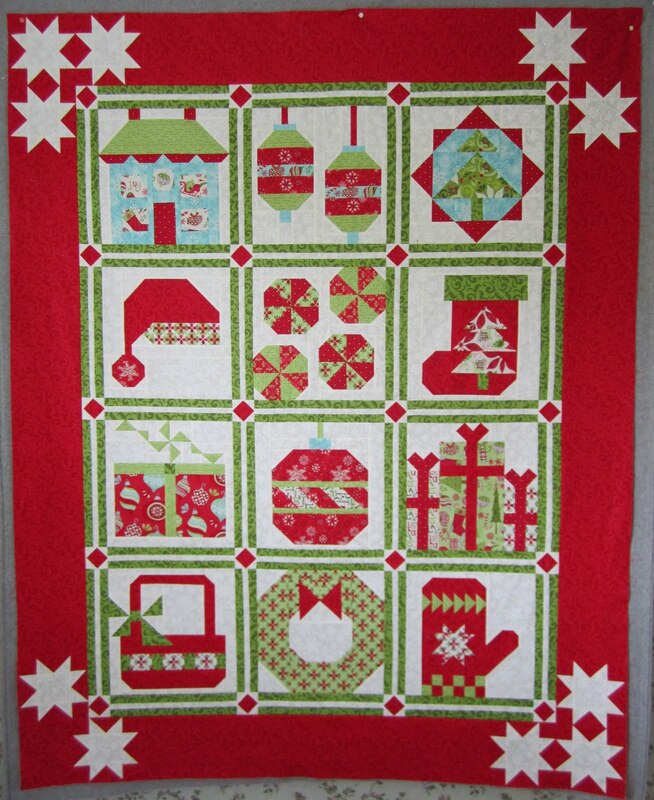 The quilt looks great, and will be a seasonal treasure for your daughter. No mystery quilts for me, either -- I like to have the complete picture at the beginning. The tweaks make the quilt just right. You have helped me realize it's worth the time to figure all that out. So much time and money invested, we should really be happy with the quilt. I love it! I also love all the little tweaks you've made - it was well worth the effort! I glad you fixed the border LOL because I was going to have to write you and say "FIX IT" lol! Looks wonderful Thelma! All that red just makes me smile!! I love the way you tweak your quilts! Your daughter is a lucky girl to have this coming her way! Stunning!! Your daughter will love it!! Who wouldn't?!!!! My friend is working This too! Yours is gorgeous, lucky daughter!!! It's gorgeous! Every change you made is terrific -- spot on perfect! This came together just perfectly with all your "thelmafying" elements. I'm sure your daughter will love it. I would have turned the border too! i love the sashing you decided to go with, it looks great! I mentioned you on my blog today as I passed on the Versatile Blogger Award. I really enjoy reading your posts! It turned out fabulous. I really like it and admire your ability to change things up! Mine is exactly like it is supposed to be except for a few messups that didn't matter that I left...not exactly planned! I enjoyed seeing yours come together and will use that trick of adding another strip to tone down a border in the future! Cute quilt! I like it better without the poinsettia fabric and I'm so glad you fixed the last border. Things like that drive me crazy too, I couldn't have left it that way. That quilt is really really sweet Thelma! I love your version of the sashing with the cornerstones... it's perfect! I am so glad you took a "moment" to switch your bottom border! When I was reading... for a moment I thought you were going to leave it, shweeew! I am so glad you finished yours. Now I can copy you!!! No one will ever see that except your expert eye. It is GORGEOUS. And thank you so much for sharing the process with us beginners. I love it Thelma...love the way you did the sashing...I haven't done mine yet...I hate doing those square in a square blocks...I need to just DO IT!